Although tea drinking has been associated with health benefits for centuries, only in recent years has its medicinal properties been investigated scientifically. 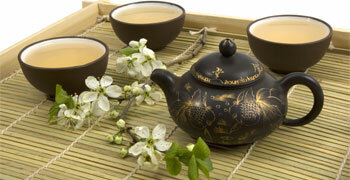 Tea's health benefits are largely due to its high content of flavonoids — plant-derived compounds that are antioxidants. Green tea is the best food source of a group called catechins. In test tubes, catechins are more powerful than vitamins C and E in halting oxidative damage to cells and appear to have other disease-fighting properties. Studies have found an association between consuming green tea and a reduced risk for several cancers, including, skin, breast, lung, colon, esophageal, and bladder. EGCG is one of the most potent antioxidants in Green Tea. According to the American Chemical Society, EGCG proved to be 100 times more effective in neutralizing free radicals than vitamin C and 25 times more effective than vitamin E.
Catechins in Green tea serve as antioxidants, which remove free radicals, help prevent and slow down tumor formation and help prevent heart disease by repressing LDL cholesterol levels, easing hypertension. Catechins are helpful for dieters as they promote neutral fat and carbohydrate metabolism. They also help prevent allergic reactions by retarding histamine release. Overall, green tea help fight against arteriosclerosis, hypertension, arthritis, diabetes, tumors, infectious disease, and aging. Green Tea contains fluoride and is known to help prevent cavities and tooth decay, strengthen bones. It kills bacteria which causes gum disease and gingivitis. Other acclaimed benefits include aiding digestion, blood purification, boost immune system, enhance heart function, suppress aging, deter food poisoning, lower blood sugar levels and fight viruses.